"Ah, Grizzly tanks. Forge's pet project." — Serina on Sergeant Forge's fixation with Grizzlies. The M850 Grizzly, formally the M850 Main Battle Tank, is an armored mobile weapons platform in service with the United Nations Space Command. It was developed by Chalybs Defense Solutions, the manufacturer of the older and more common M808 Scorpion. The M850 Grizzly is the heaviest armored vehicle in service with the UNSC Armed Forces, and is usually deployed in situations that require devastating firepower and a resilient design in single mobile package. The M850 Grizzly shares a similar design to the M808 Scorpion, also developed by Chalybs Defense Solutions. For ease of mobility across varied terrain, the Grizzly is fitted with a four-bogey tread configuration, similar to the Scorpion's. Compared to the M808, the M850 MBT is more heavily armored due to its large profile. As with the Scorpion, the driver's access hatch is located in the center of the chassis in front of the turret. The M850 Grizzly is protected by exceptionally thick armor plating that allows the tank to sustain large amounts of damage. The tank's resilient armor is capable of tolerating multiple blasts from heavy plasma cannons. At 12.3 meters (40 ft) in length and a mass of over 71 tons, the Grizzly is larger than the Scorpion, although the latter reaches significantly higher speeds than the Grizzly's maximum speed at 69 kilometres per hour (43 mph). The turret is larger than that of the Scorpion and features a separate access hatch, as it is designed to support two M310 120mm smooth-bore high-velocity cannons, as opposed to the M808's single M512 90mm cannon. The cannons can be outfitted with S1 canister shells, which produce a high explosive blast radius, increasing the weapons' lethality against all targets. The Grizzly's powerful cannons are capable of breaking through an opponent's shields and hull in a single strike. Like the Scorpion, the M850 Grizzly features a single coaxial M247T machine gun mounted on the turret to the right of the cannons; post-war models also include a pintle-mounted M247T near the turret access hatch. Smoke grenade launchers are affixed to the forward edges of the turret. Some Grizzly tanks also feature missile launchers. The M850 Grizzly, first manufactured in 2509, is not as old as Chalybs Defense Solutions' better-known, more widely deployed M808 Scorpion, which has been in service since the Insurrection. The origins of the Grizzly are shrouded, due to maneuverings by many competing bureaucratic and corporate interests within the UNSC at the time of its development. The Grizzly quickly found a niche with Army and Marine units despite initial skepticism and the logistical challenges of transporting it. The Grizzly proved invaluable both as an anti-armor vehicle and a mobile fortress that could drive straight into the heart of insurrection positions and outgun any rebel armored vehicles. The beginning of the Human-Covenant War cemented the Grizzly’s reputation as the bane of enemy armored vehicles. On the open field the Grizzly was practically unstoppable, and often forced the Covenant to deploy naval assets in order to decisively end the threat that even one or two tanks could cause to their staging areas and supply columns. The UNSC Spirit of Fire carried a large complement of Grizzlies, largely due to the preferences of Sergeant John Forge, who turned the tanks' acquisition into a personal project of his. The Grizzly was notably deployed during the Harvest campaign, during which it performed exceptionally. While investigating a Forerunner structure on Harvest in early February 2531, a platoon of Marines assigned to the UNSC Spirit of Fire, as well as Professor Ellen Anders, were attacked by Covenant forces. Two Grizzlies, which had been personally upgraded by Sergeant Forge, were sent to the structure to rescue the survivors. They made their way through several Covenant blockades, killing dozens of infantry and destroying large amounts of matériel while sustaining very little structural damage. As Anders and Forge were airlifted from the site, the Grizzlies remained behind to cover their escape. A column of Grizzly tanks advancing upon Covenant positions on Draetheus V.
On February 23, 2531, Spirit of Fire was suddenly drawn toward the interior of the Etran Harborage; three platoons remained groundside, prompting the crew to attempt a hasty retrieval operation. Alpha Platoon was escorted by a Grizzly, which was used to provide cover fire for the Marine infantry as they fought numerous Flood forms. Though the Marines were highly susceptible to infection while on foot, those inside the sealed cockpit of the tank were immune; this allowed the MBT's crew to clear a path for the infantry and other vehicles, who eventually arrived at a hastily established firebase. When the survivors reached the evacuation zone, the tank was presumably left behind. Grizzly tanks were utilized during the Battle of Mombasa in 2552 by an ODST squad, when they were ordered to destroy Covenant shield generators and help pinned-down marines recover vital intel. The M850 saw limited use later in the war. This was not due to poor performance, as the Grizzly was considered to be very powerful and reliable. Rather, it was due to the tank's exorbitant cost, stringent maintenance requirements, relative difficulty of transportation, and the remaining heavy-lift spacecrafts were tasked for high-priority reconstruction. After the Human-Covenant War, several Army units maintained Grizzly units for planetary defense. Several Grizzlies were used in the Battle of Draetheus V against Merg Vol's Covenant in 2554. M850 Grizzlies were utilized by the crew of the Spirit of Fire against Banished forces on Installation 00 in April 2559. In-game, the Grizzly is an extremely capable vehicle, suitable for defeating large numbers of enemy troops and vehicles. Since it possesses a secondary canister shell attack, it can kill infantry with ease due to the shell's large blast radius. This canister shell ability is the same upgrade that can be applied to the Scorpion tank by the player and the upgrade works equally well for both. The armor plating is superior to that of most vehicles, able to survive multiple shots from a Hunter's assault cannon, and can survive a sustained hit from a Type-47B Scarab's main gun twice as long as a Scorpion. The coaxial machine gun has a faster firing rate and inflicts more damage per hit than the Scorpion's, at the cost of a longer reload time. Its main disadvantages are the cost it requires to be researched, its reduced effectiveness against other vehicles and its minor ineffectiveness against airborne units. Like the Scorpion, it is "hard countered" by SP42 Cobra, especially while they are in lockdown mode. Though the in-game model features smoke grenade launchers they are not usable. In the campaign level Relic Interior, the player can use Professor Ellen Anders to repair their two Grizzlies while in other levels they can be repaired the same way as any other vehicles. In Halo Wars's skirmish and multiplayer modes, the Grizzly serves as one of Sergeant John Forge's unique units. It is accessed as an upgrade to the Scorpion. The player can operate the M850 Grizzly in the campaign levels Assault on the Covenant Landing Zones, Breach of the Bulwark, and Behind Enemy Lines. The coaxial M247T machine gun is present but can be used by the player by pulling the trigger while the main cannon is fired with the grenade trigger. Instead, as with the game's version of the Scorpion, the player may utilize an M247T mounted on top of the main turret; this machine gun may be rotated 360 degrees. The Grizzly is the most powerful vehicle in the game, far outclassing the firepower and armor of the Scorpion and Type-26 Wraith. Its main cannons have a high rate of fire and produce a heavy degree of splash damage, allowing the player to keep targets under near-constant fire. In both Spartan Assault and Spartan Strike, the Grizzly can destroy any vehicle wreckage by simply running over it. However, the Grizzly will take damage, albeit very little, if the player runs over any abandoned civilian vehicles without destroying them first, as the explosion from the vehicle being run over will damage the Grizzly. In Spartan Strike, if the player fires the main cannon too frequently, it will occasionally only fire a single shot. A render of the Grizzly in Halo Wars 2. In Halo Wars 2, Grizzlies feature missile launchers in place of their canister shell ability. Grizzlies are given to the player to use in Last Stand, and are available on Operation: SPEARBREAKER Campaign by using Major Vaughan's Grizzly Battalion Leader Power. Like their Halo Wars counterparts, Grizzlies are exclusive to John Forge in multiplayer, though they now replace Scorpions outright, and can be built at the UNSC Garage. Grizzlies are no longer listed as Super Units in Halo Wars 2, the only UNSC Super Unit being the G81 Condor gunship. In Blitz, they cost 160 energy. Population consumption tripled, from 3 to 9. Missile Barrage must now be researched. The Grizzly is uncannily similar in appearance and role to the iconic Mammoth tank from the Command & Conquer franchise. 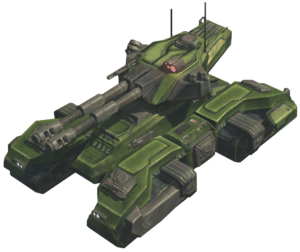 Both the Grizzly and the Mammoth rest on four independently suspended tracks, possess dual cannons and secondary weapons (particularly missile launchers, as equipped by the Halo Wars 2 version), and are the heaviest tank available to their respective factions. Like most UNSC vehicles, the Grizzly vaguely resembles its animal namesake. Both the tank and the grizzly bear are extremely large and resistant to harm, and both possess powerful attacks; the bear is capable of decapitating a human with a single swipe of its paw, while the M850 MBT can destroy all but the most powerful ground targets with relative impunity. The Grizzly was said to be equipped with a flamethrower early in the development of Halo Wars. However, as the same interview sensationally described the Cyclops as a "colossal bipedal mech", the claim may have been erroneous. Early concept art of the M850 Grizzly for Halo Wars. Concept art of two Grizzlies in combat. Note how the armament differs from the final version. A trio of Grizzlies attacking a Covenant base. A pair of M850 MBTs in combat. A trio of Grizzlies piloted by Spartan-IIs engage multiple Type-26 Wraiths. Grizzlies getting repaired by Cyclops. A post-war M850 Grizzly in Halo: Spartan Assault. Note the additional machine gun on the main turret. A column of a Grizzly and a Scorpion on Dratheus V.
An M850 Grizzly fending off several T-26 Wraiths during the Battle of Draetheus V.
A Grizzly under attack in Halo: Spartan Strike. Concept art for the Grizzly for Halo Wars 2. More Halo Wars 2 concept art. M850 Grizzlies during the Second Ark Conflict. Grizzlies launching missiles at Banished forces. An M808S Scorpion with an M850 Grizzly. An army of Grizzlies with EV-44 Nightingales as support. A Grizzly with Marines and M121 Jackrabbits.